Congratulations, BMW — you have actually created a rear-wheel-drive hatchback that I am not excited about. That's because you have built the 3 Series GT, a taller, sloped hatch version of the venerable 3 Series sedan. We've been titillating you with spy shots (yeah right) for months, but this photo posted on spy photog Chris Doane's Facebook page, who you might remember from such leaked pics as the Jag F-Type, is almost certainly the real deal. They call it "The Hunchback of Munich." This is fairly accurate. 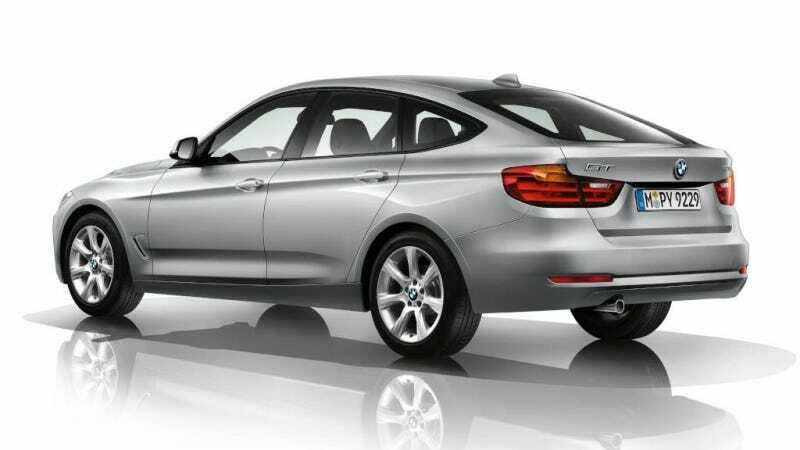 Is This The BMW 3-Series GT? Again? If so, why is it all covered in swirls? We&apos;ve all seen it already. Why did BMW do a GT version of the 3 Series, anyway? Two years ago, you had the CEO of BMW North America admitting that sales of the 5 Series GT have been abysmal, and that it failed to attract the wagon buyers they wanted. Maybe because it's not a wagon? I'll give BMW credit for one thing: the 3 GT looks slightly better than its big brother the 5. But really, you're gonna want to hold out for the 3 Series Sports Wagon, which we Americans will be getting at some point.